Ocean View, Two Bedroom, Two Baths, sleeps 6 people. Professionally decorated condo built in 2002. River in back with turtles to feed, private golf course beyond that. 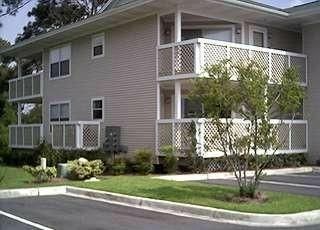 Near barefoot landing and tons of shopping within walking distance. Restaurants within walking distance. Has to be seen to be believed! Inquire now for special rates! Surf Golf Course. Beautiful view of Surf Golf Course on the back deck. Condo was clean and bright. Bath towels were thick and wonderful to use. Chairs on balcony off of bedrooms were rusty, so we didn't use them, but it was WONDERFUL to lean on the rail and watch the turtles. Contact person for the condo was prompt in responding to any questions that we asked. thank you diane for the nice review. replace this october when i go down. Nice place. Roomy. Close to the beach. Nice place, with a good sized bedrooms. Clean. Very close to the beach. Pool was clean with good hours. Open till 11:00 P.M.
please come back and vacation again with me. Had a great time had some bumps in the vacation but the owner was great about getting things fixed. Would stay again. Thanks for an awesome vacation. thank you for the nice review. i welcome you back anytime. Sept 14-26, 2018. You get what you pay for. A place to hang your hat. I was not impressed with the condo from the moment I walked in. Everything is very dated, well used well worn for many years. I suspect it was from the 1980’s. Sofa and chairs were very old. The dinning room table was filthy. I sent a picture to the owner of just how nasty it was. I also told her in text that the condo was well worn. The photos make the place appear to be quite lovely. Don’t be fooled. Very deceptive. There were very few serving dishes for meals. I used a twin flat sheet for a table cloth. Beds are not comfortable. If you have stayed in luxury condo’s keep looking this is not for you. There are no fancy frills. No down comforters or 1000 count sheets. No thick towels & wash cloths. (just the opposite). No beach views. Positive notes: It’s close enough to the beach to walk. The pools are close. The Cherry Grove Pier is about a mile away. Great bar there. Grocery and ABC Pkg close drive. Check out Ducks on main, shopping & restaurants. Yes I let my toddlers run wild with sliding doors open. I smoked on porches & pool. My husband brought our 4lb teacup Yorkie and our 6lb Yorkie-Poo down on the weekends. We did not get our deposit back. 12 days at the beach! Advertising for the condo was about $400 cheaper than the final agreement made for stay. I have stayed at much nicer condos at Folly Beach (Charleston), and Hilton Head. Don’t expect four poster beds, exquisite linens or high quality linens. There is a cleaning fee you’ll have to pay and you will find a sheet of paper with a long list of cleaning that is expected. Being there 12 days I did normal housework and took advantage of the laundry stack washer & dryer. The master has 2 twin beds pushed together, a rollaway bed in closet. 2nd bedroom - I used this one- has double bed and sofa bed. There is a small tv that didn’t work in MB, a small flat screen in 2nd BR. The living room has round glass coffee tables. Dangerous for kids. I put them behind the sofa. Don’t expect matching stemware or serving dishes. Very cottage like atmosphere. I was not impressed at all. We made the most of our situation. My traveler forgot to mention in her review that she broke all house rules. 2. traveler smoked continuously, leaving cigarette butts on the floor and in the dishwasher. 3. traveler sent me a private message that she knew she wouldn't get security back but it was worth having her dogs with her. 4. In that message she also said the children she had in her care had many emotional problems before she got them and they urinate everywhere. 5. i had to completely scrub down the condo because of the terrible condition the traveler left it in. 6. this traveler had total disregard for other peoples property. 7. this traveler wrote a terrible review because she did not get her security back. We stayed for 2 weeks the condo is spacious and secluded. Minutes to the beautiful beach. Would definitely stay here again!